820 Naval Air Squadron is a Royal Navy Fleet Air Arm carrier based squadron formed at RAF Gosport on 3 April 1933 with the transferral of the Fairey III aircraft from 450 Flight and half of 445 Flight of the Fleet Air Arm of the Royal Air Force. It has operated, with a number of brief gaps, up to the present day and continues in service, flying the AgustaWestland Merlin HM.2 from RNAS Culdrose. The squadron's first assignment on its formation was to carry out spotter-reconnaissance duties for the aircraft carrier HMS Courageous. 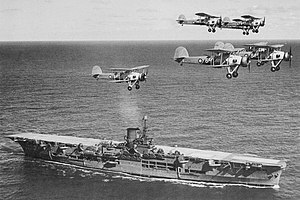 They were later re-equipped with Fairey Seals and Blackburn Sharks, eventually receiving Fairey Swordfish in autumn 1937. The squadron was reassigned in November the following year to the new aircraft carrier HMS Ark Royal. The squadron operated from Ark Royal for the next three years, initially on anti-submarine duties, but later as surface search and torpedo-attack aircraft. The squadron went with Ark Royal to the Atlantic, and by April 1940 they were supporting Allied operations during the Norwegian campaign, where they bombed Vaernes airfield. After the withdrawal from Norway, Ark Royal and the squadron moved to the Mediterranean in June. Aircraft from 820 squadron were involved in attacking the French fleet at Mers-el-Kébir, and later the Battle of Dakar, as well as attacks at Cagliari. They were also active during the Battle of Cape Spartivento, as well as covering convoys to Malta. 820 Squadron's next major engagement was the hunt for the German battleship Bismarck. Aircraft from the Squadron were able to disable Bismarck’s steering gear with a torpedo hit, allowing Bismarck to be engaged and sunk. In June 1941 the squadron left Ark Royal, and in November that year returned to Iceland aboard HMS Victorious. The Swordfish were then replaced with Fairey Albacores. 820 Squadron then embarked aboard HMS Formidable in February 1942, and sailed with Formidable to serve in the Indian Ocean. The squadron was then active in the Battle of Madagascar, followed by Operation Torch, the Allied landings in North Africa. During these operations, aircraft from the squadron sank U-331, which had earlier sunk the battleship HMS Barham. Formidable and the squadron remained in the Mediterranean to provide support for the Allied landings at Sicily and Salerno. A Fairey Albacore from 820 NAS takes off from HMS Victorious, March 1942. An 820 NAS Avenger Mk.II going over the side of HMS Indefatigable during the Sakishima campaign, 1945. The squadron then returned to the UK in November 1943 and disbanded at RNAS Donibristle. The squadron was quickly reformed however, and equipped with 12 Fairey Barracudas was initially based at RNAS Lee-on-Solent as a torpedo bomber/reconnaissance squadron. They were assigned to HMS Indefatigable in June 1944 and saw action as part of Operation Mascot on 17 July and Operations Goodwood in August, the attempts to sink the German battleship Tirpitz in Kaa Fjord, Alta, Norway. The operations failed to cause significant damage to Tirpitz. The squadron was re-equipped with 21 Grumman Avengers in September 1944 and sailed with Indefatigable to the Far East in November. They sailed to Ceylon where 820 squadron joined No 2 Strike Wing, which also consisted of 849 Squadron. The Wing attacked the oil refineries at Palembang, Sumatra in January 1945 as part of Operation Meridian, following this up with later strikes on the Sakashima Gunto islands. As the war in the Pacific moved closer to Japan 820 Squadron was assigned to the 7th Carrier Air Group, and carried out a number of raids on Tokyo prior to VJ-Day. After the end of the war, Indefatigable remained in the Pacific for some time, finally returning to the UK in March 1946. 820 Squadron was then disbanded again. The squadron was re-formed five years later in July 1951, this time flying the Fairey Firefly. The squadron was embarked alternately aboard the carriers HMS Indomitable and HMS Theseus during 1952 and 1953, spending most of its time on exercises in the Mediterranean. The squadron operated the Grumman Avenger and then the Fairey Gannet during 1954 and 1956, aboard HMS Centaur and HMS Bulwark, before the decision was made to convert 820 Squadron as a helicopter squadron. 820 disbanded on 2 December 1957 but were immediately re-formed the same day at HMS Vernon, equipped with the Westland Whirlwind HAS.7. They were assigned to HMS Hermes in May 1958 as an anti-submarine and commando support force, remaining aboard Hermes until October 1960, when the squadron was again disbanded. The squadron was re-formed in 1964, and equipped with the Westland Wessex HAS.1, with which they served as anti-submarine squadron aboard HMS Eagle. They were upgraded to the Westland Wessex HAS.3 in May 1969, when they were transferred to the Tiger-class helicopter cruiser HMS Blake. They remained aboard Blake until her disposal in 1979, the squadron was then assigned to HMS Hermes for the first quarter of 1980. The squadrons aircraft had been upgraded with the Westland Sea King HAS.1 in December 1972, followed by the HAS.2 version and then the HS.Mk.5 in December 1980. It was then assigned to HMS Invincible in early 1981; on 6 March 1981 the squadron suffered a tragedy when two of its aircraft had a mid-air collision, five of the eight crew members were killed. An 820 NAS Sea King HAS.6 landing on USS Enterprise, in 1996. In April 1982 the squadron remained embarked for the Falklands War. During the conflict the squadron flew over 4700 hours, with Invincible spending 166 days continuously at sea, setting a world record for continuous carrier operations. The squadron transferred to HMS Ark Royal in late 1985. They were re-equipped in February 1990 with the Sea King MK6 and on board Ark Royal were dispatched to the Eastern Mediterranean on 10 January 1991, with the intention of transiting the Suez Canal, so they would be in the Red Sea for Operation Granby - UK name for Desert Storm. However, the war started before they could transit the Suez Canal, and instead, Ark Royal, remained in the Eastern Mediterranean for the duration of the War. In January 1993, 820 were dispatched aboard RFA Olwen and RFA Fort Grange to support the British forces in Bosnia as part of Operation Grapple. There the squadron was used to ferry men and supplies. 820 Squadron returned to Bosnia in 1994, this time aboard HMS Ark Royal. With the later decommissioning of Ark Royal, the squadron joined HMS Illustrious and by 1996 was in the eastern Atlantic, followed by a round the world deployment in 1997. With Illustrious in refit from 1998, 820 Squadron operated out of RNAS Culdrose on anti-submarine training exercises, followed with periods embarked on ships of the Royal Fleet Auxiliary. They rejoined Illustrious in 1999 and participated in relief operations in Mozambique, aboard RFA Fort George, and for Operation Palliser in Sierra Leone. Further training periods followed, as well as a Search and Rescue effort in October 2004 to aid the stricken Canadian submarine HMCS Chicoutimi, which had been disabled after suffering a fire and flooding off the west coast of Ireland. The squadron continues to carry out exercises aboard Royal Navy and Royal Fleet Auxiliary vessels, as well as participating in military operations. It is based at RNAS Culdrose and operates the AgustaWestland Merlin HM.2. Training is performed by 824 NAS and front line duties are shared with 814 NAS. During 2014, 820 NAS was temporarily assigned to the Commando Helicopter Force until the two main troop carrying squadrons fully convert to the Merlin HC.4. 820 NAS has now become the "queens squadron" and will be the main squadron to operate on the Queen Elizabeth class aircraft carrier. 3 Merlins from 820 NAS were deployed off RFA Argus as the UK's response towards the 2014 Ebola virus. 820 NAS will be permanently attached to HMS Queen Elizabeth's air group. On 3 July 2017, a Merlin Mk.2 helicopter of 820 NAS became the first aircraft to land on HMS Queen Elizabeth, piloted by 26 year old Lieutenant Luke Wraith from Yorkshire. ^ "Fleet Air Arm Battle Honours". www.fleetairarmoa.org. Fleet Air Arm Officers' Association. 2011. Archived from the original on 14 April 2011. Retrieved 5 April 2011. ^ a b c d e f g h i j k l m n o p "820 Naval Air Squadron – History". www.royal-navy.mod.uk. Royal Navy. 2009. Archived from the original on 2 October 2011. Retrieved 5 April 2011. ^ Fletcher 1995, p. 176. ^ "820 Naval Air Squadron – present day". www.royal-navy.mod.uk. Royal Navy. 2012. Archived from the original on 2 October 2011. Retrieved 8 June 2012. ^ "UK military to provide further measures to tackle Ebola - Royal Navy". www.royalnavy.mod.uk. Archived from the original on 11 October 2014. ^ "Fleet Air Arm 820 Squadron". www.fleetairarmarchive.net. Fleet Air Arm Archive. 23 February 2001. Archived from the original on 5 June 2011. Retrieved 5 April 2011. ^ "820 squadron Fleet Air Arm, 1933 to present". www.helis.com. Helicopter History Site. Archived from the original on 1 November 2010. Retrieved 5 April 2011. Sturtivant, Ray & Theo Ballance. The Squadrons of the Fleet Air Arm. Tonbridge, Kent, UK: Air Britain (Historians) Ltd, 2016. ISBN 0-85130-223-8. Wikimedia Commons has media related to 820 Naval Air Squadron. "820 squadron Fleet Air Arm, 1933 to present". www.helis.com. Helicopter History Site. Retrieved 5 April 2011. "Fleet Air Arm 820 Squadron". www.fleetairarmarchive.net. Fleet Air Arm Archive. 23 February 2001. Retrieved 5 April 2011. "Other Naval Air Squadrons". www.hmforces.co.uk. HMForces. Retrieved 5 April 2011. Pike, John (27 April 2005). "Operations in Iraq: First Reflections". www.globalsecurity.org. Retrieved 5 April 2011.